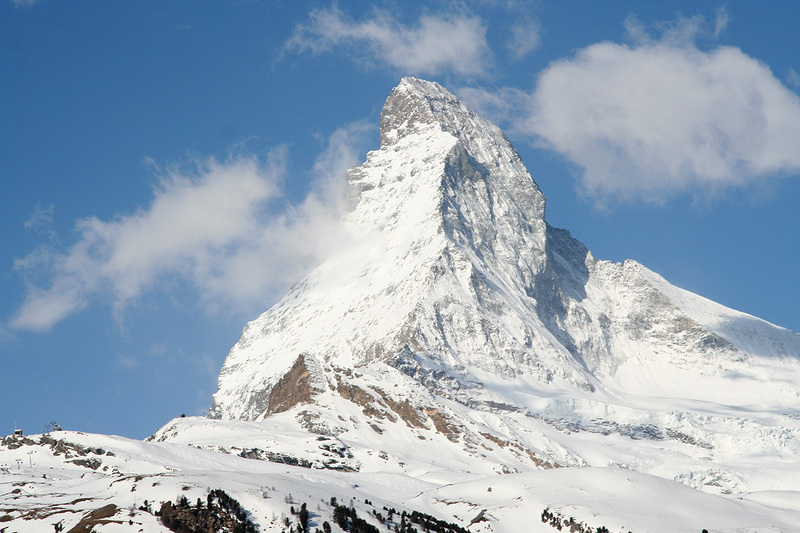 How to get there: The normal starting point, in particular when skiing, is the famous Swiss alpine village of Zermatt. 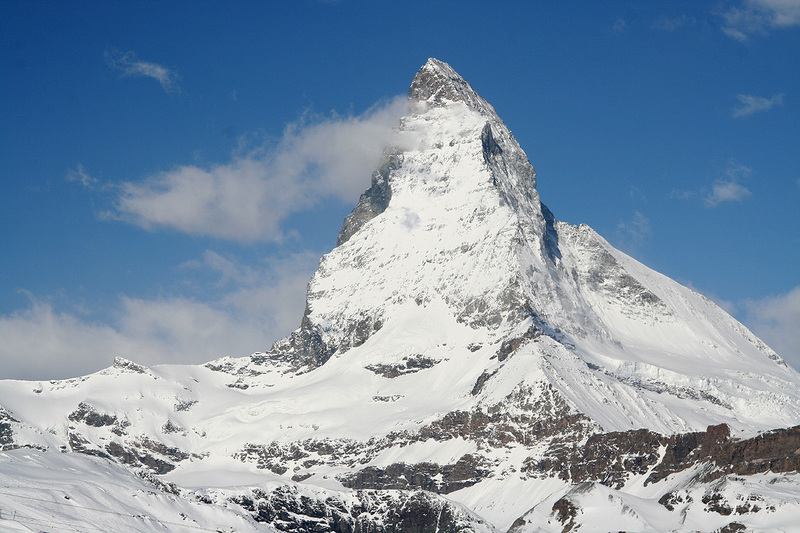 One can reach Zermatt from the Geneva airport in about 2.5 hours of driving, mostly on a high quality freeway. The distance is 235 kilometer. Start out from Geneva in the direction of Lausanne (E-62/E-25), continue on a freeway signed as Hwy. 9 from Lausanne through Montreux and Martigny. The road continues through Sion and Sierre, then changing to a two-lane road that continues to Visp. Before entering Visp, there are clear signs for Zermatt. 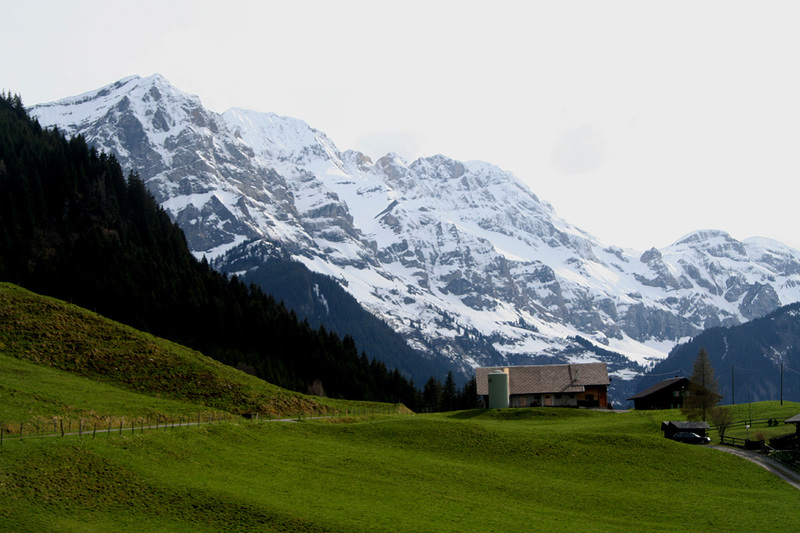 Drive up this narrow valley to the village of Täsch and find parking. It is not permitted to drive in Zermatt, except for electric vehicles, thus the normal procedure is to park in Täsch and take the frequently running shuttle train from Täsch to Zermatt. 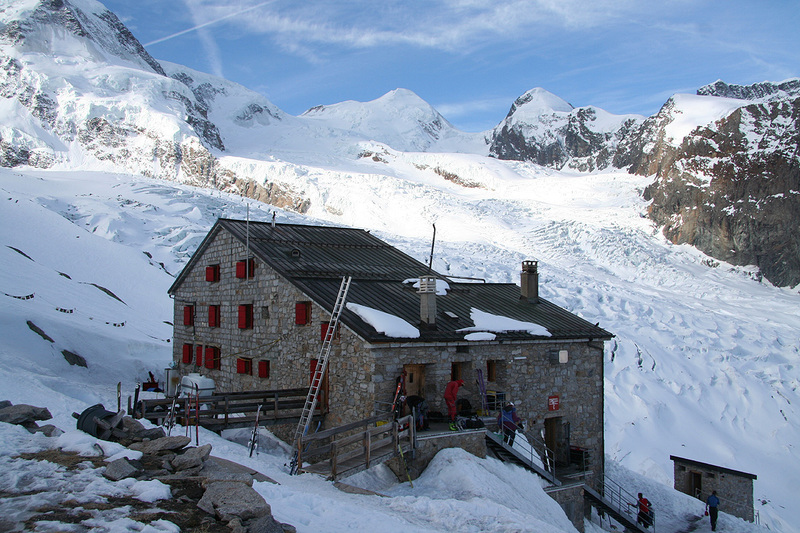 Note that the Monte Rosa hut is popular, reservations well in advance is recommended. You can reserve by calling +41-(0)279672115, they like a credit card in order to guarantee your reservation. Most of the routes described below are indicated on this picture. 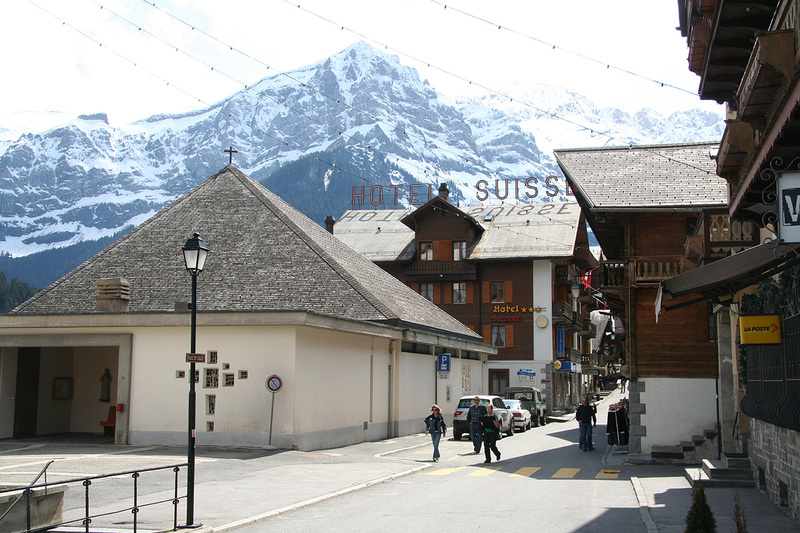 First, to the hut: In Zermatt, just across the street from the railway station, you will find the departure hall for the Gornergrat cog railway. Buy a ticket for the Rotenboden station, (Swiss Franc 33 as of May 2008). This is the next to the last station. This train runs fairly frequently during the daytime. Get off at Rotenboden, this is the trailhead, location N45:59.063, E007:45.919, elevation 2823 meter. 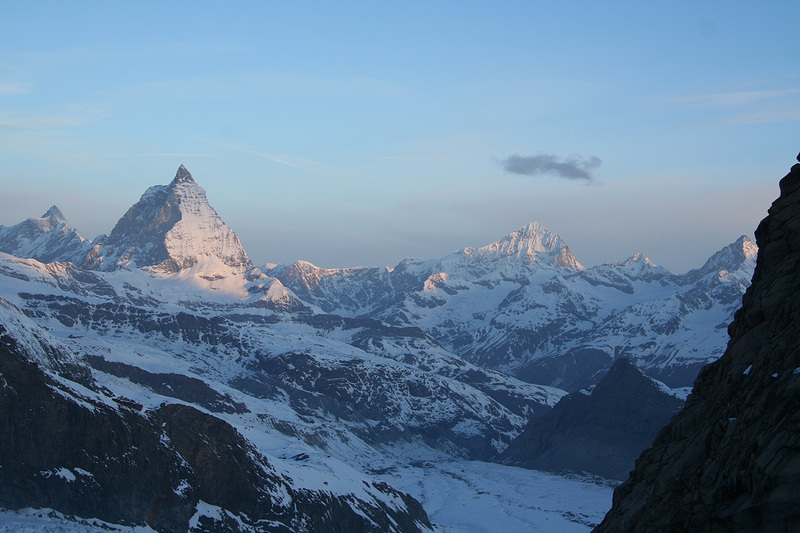 The views from here are exceptional, the famous Matterhorn as well as our target, Dufourspitze are in clear view. There is a very obvious trail (or in the spring track) that heads out from Rotenboden station and in the direction of Dufourspitze. 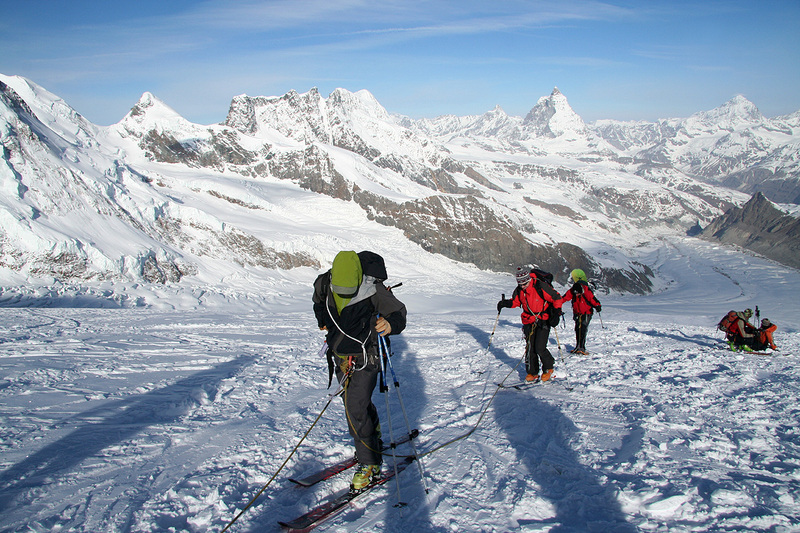 We are on the Gornergrat (ridge), the objective is to follow the trail as it traverses the south side of this ridge, going eastwards in order to reach the glacier below. 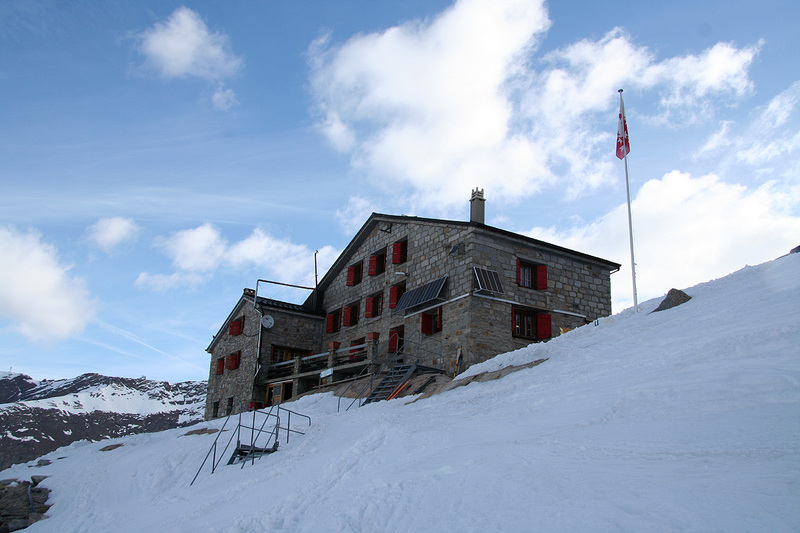 The Monte Rosa hut is located above a somewhat steep slope across the first part of the valley, on the lower slopes of Monte Rosa. Fortunately, this south facing slope (of the Gornergrat ridge) melts off rather quickly, thus providing a snow free route on a good trail already sometime in (early?) April. Proceed along this trail until you reach the more level area below the ridge itself. 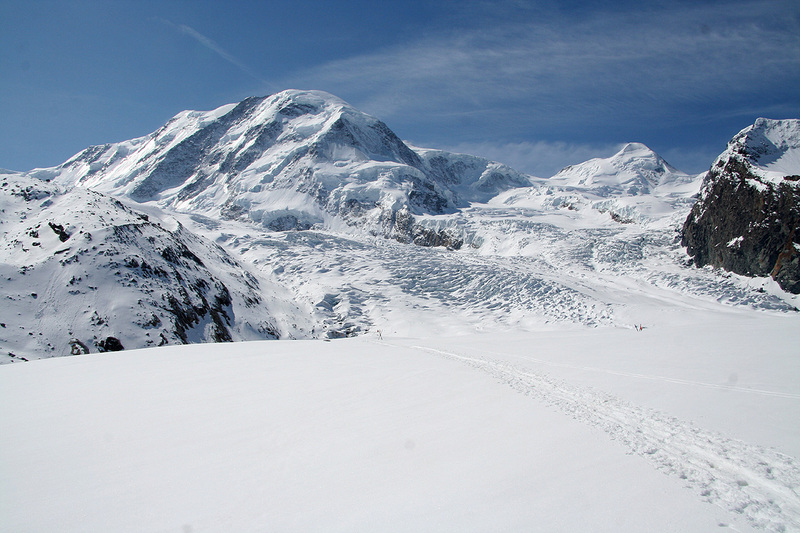 From here, there are two routes to the Monte Rosa hut. The short, direct route: Continue downhill as your route will curve a bit right un order to reach the upper end of the fairly flat, big glacier below. That is, you should reach the glacier fairly close to where it starts going more steeply up the valley. Cross this upper part and keep left as you enter the gully that is formed between the glacier and the steeper rock slope on your left. Ascend this slope while traversing a bit forward (that is right). 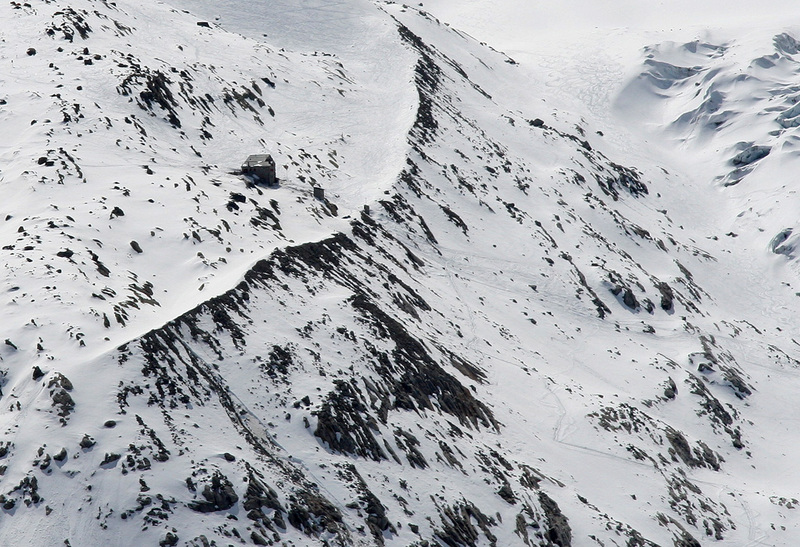 You will soon see the Monte Rosa hut babove you. Proceed directly upwards to the hut. 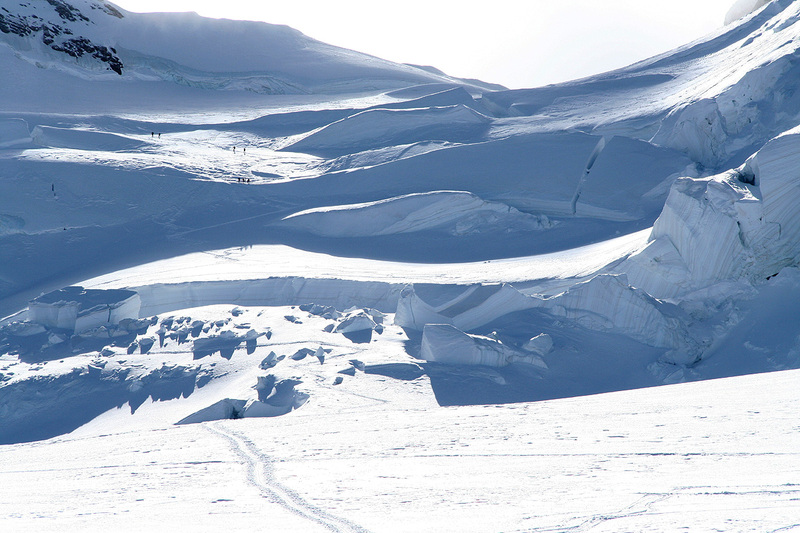 This slope is fairly steep and with icy crust most skiers will prefer to carry the skis and use crampons. 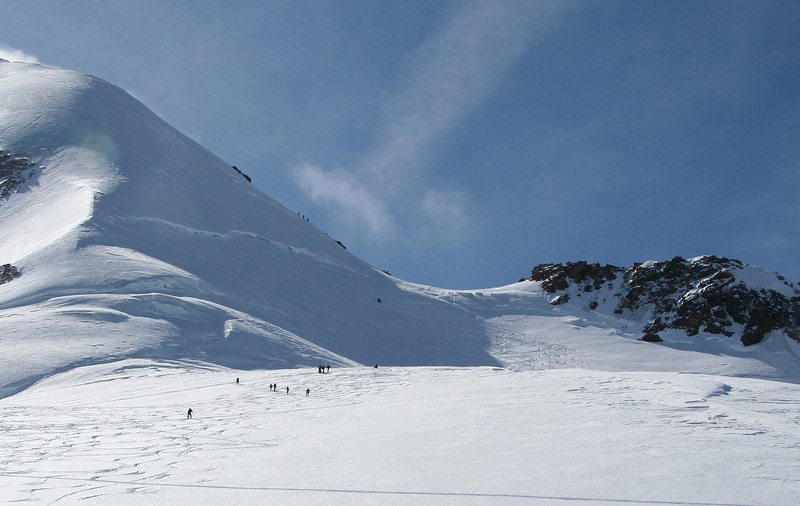 With good snow conditions, there is also a somewhat less steep alternative that proceeds partway up the glacier before traversing left and thus crossing the gully between the glacier and the rocky slope higher up. From here, one can ascend the slope to the hut while traversing somewhat towards the left. 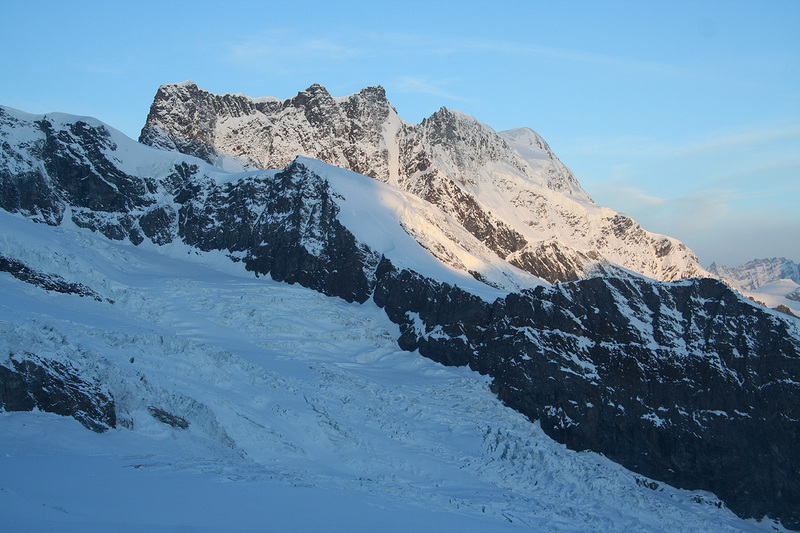 The traverse route: The following description is from the Monte Rosa hut and back to the trail that descends the Gornergrat (see above). 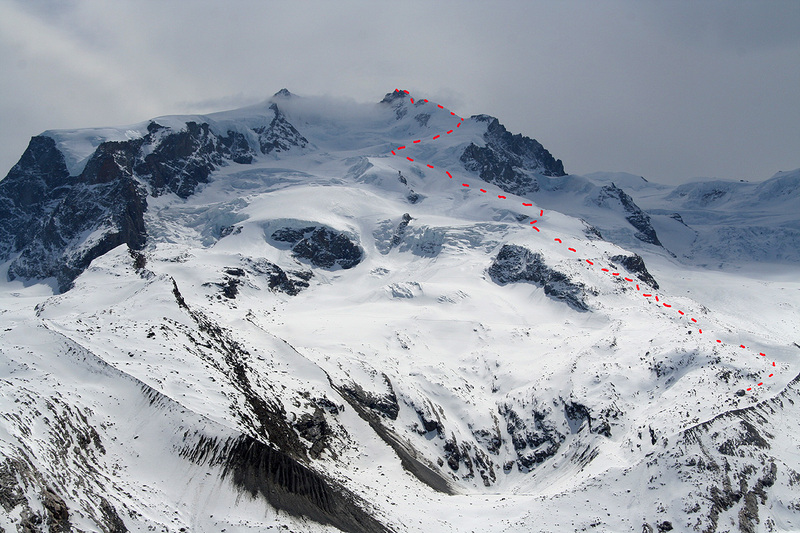 Instead of descending steeply to the glacier below the Monte Rosa hut, this route will climb above the hut, then traverse across to the glacier that is further north. 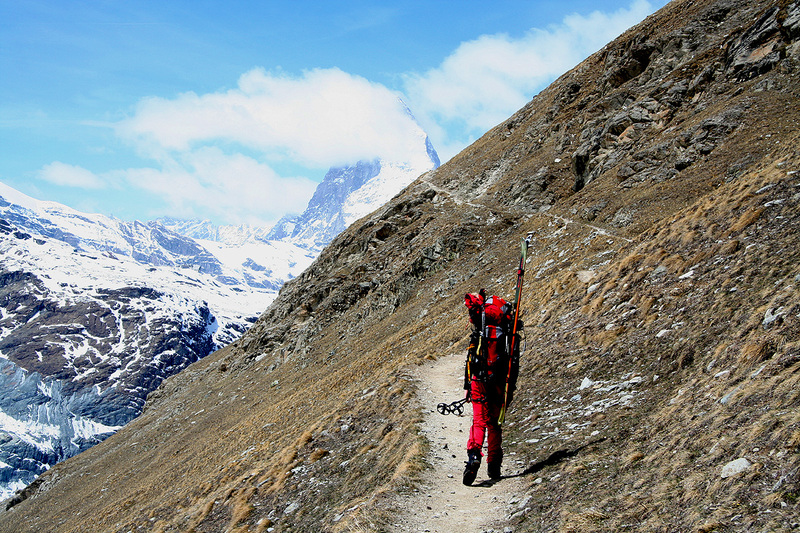 Naturally, this route may also be used going to the Monte Rosa hut. From the hut, start out on the same route as when climbing Dufourspitze, continue uphill until you reach the fairly level area below the steeper hill that must be ascended when going to the peak. Instead, curve left here and start traversing the wide snow slope while keeping your elevation. The first few meter may be a bit steep and care is needed. As you continue this traverse you will gain a pretty natural shelf underneath the rocky ridge that seemingly blocks further acess. Continue skiing at pretty much the same level and you will see the fixed wires that has been placed in the rock above (and to your left) in order to facilitate the crossing of this ridge. 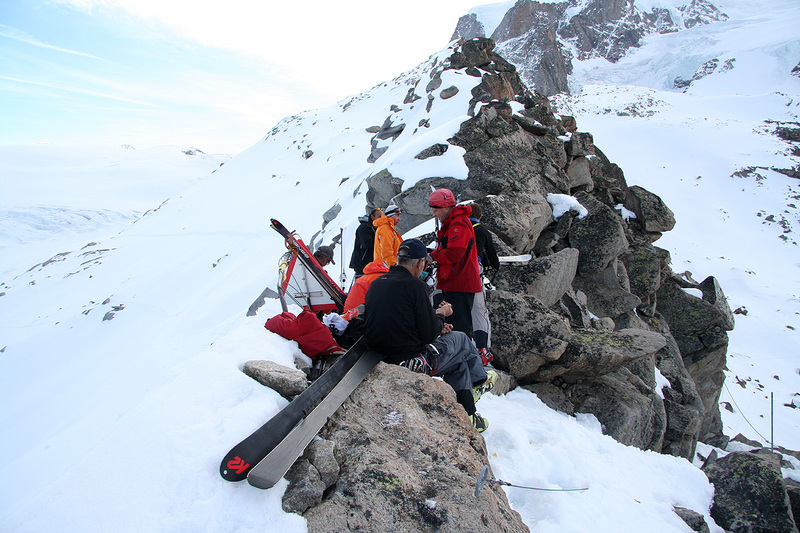 With the skis on your pack, first move up an easy ledge to your right. The "crux" of this traverse is a long step across a (small) gap as you gain a larger shelf sort of around a small corner (moving right). Alternatively, you may climb straight up the first few meter from the place where skiing ends. Above this start, the route is well protected with wire as well as a couple of iron steps. Gain the ridge. 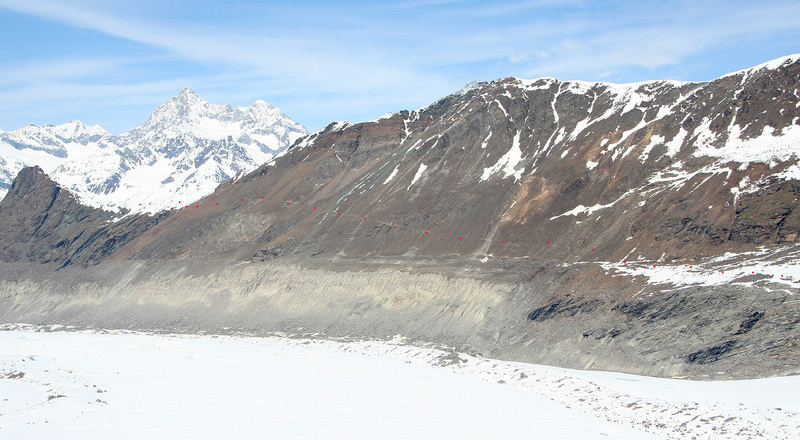 From here, one can ski while traversing right and gain the main glacier quite easily. 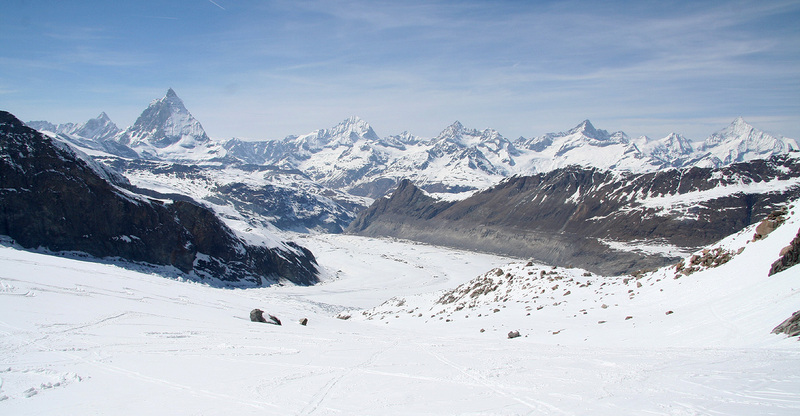 Ski sort of diagonally across this glacier towards the opposite side (The side of the Gornergrat) while also losing elevation. This ski route can be very smooth and nice. Continue downhill until you reach the beginning of the (dirt) trail that traverses up the south slope of the Gornergrat and back to the Rotenboden railway station. 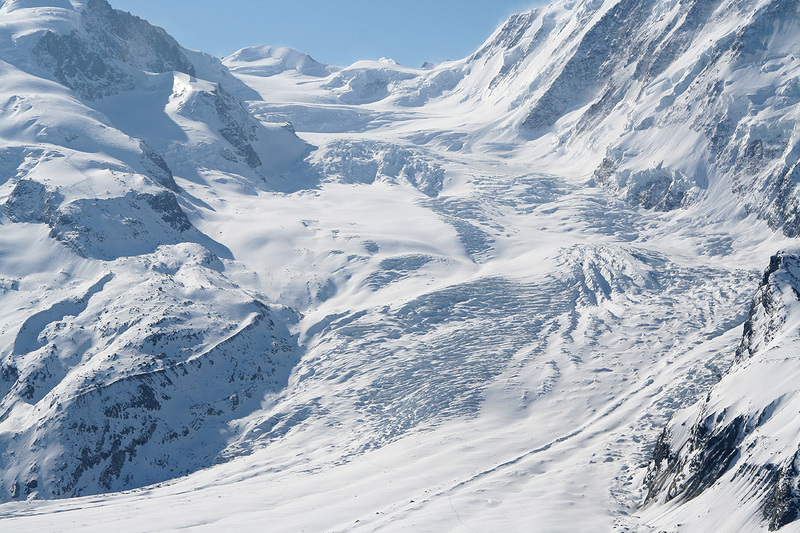 Be aware that you are on a glacier and that there may be crevasses that must be avoided. 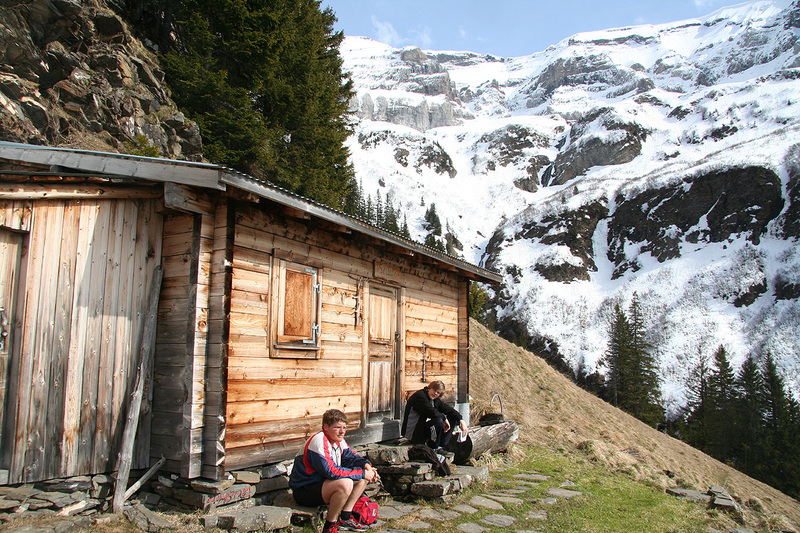 The hut: The hut sleeps perhaps 140 in a number of quite large (alpine style) rooms. You are not permitted to bring boots or backpack into the hut. Instead, they operate a system with "shopping baskets". You fill 1-2 baskets with whatever you need to bring near your bedroom. Breakfast is served at 0200 in the summer and at 0400 in the spring for people heading to Dufourspitze. There is a later time for guests with less time consuming plans. Dinner is served at 1800, then possibly again at 1930. You can buy beer and soda. We were surprised that we had to buy drinking water, (almost) as expensive as beer - 10 Swiss Francs for a 1.5 liter bottle. Next, to the summit: The route is indicated on this picture which should be looked at when reading the description below. 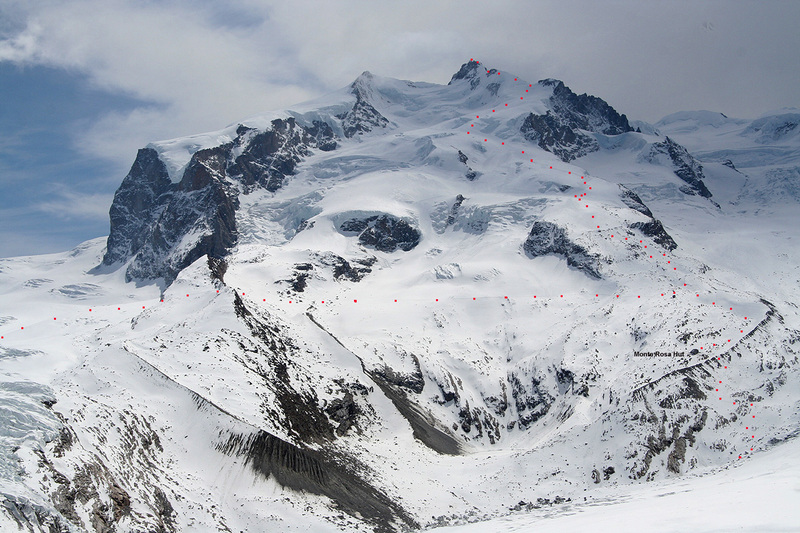 From the Monte Rosa hut, one heads uphill towards the right hand side when facing uphill. A very distinct, but tiny valley that looks a little like a half-pipe is very easy to follow. Higher up, the terrain first gets slightly less steep, then approaches a distinctively steeper section. The easiest route is likely to head up here on the right side. An alternative is to traverse a bit further right, below and around a section of rock. On the far side, another icefall flows down from the higher ground above. One can ski/climb this snow field, perhaps starting uphill further right, then traversing back left before clearing the horizon. Above this step, one follows a broad slope higher, this in turn, leads to a valley like slope with seracs on your right side. Above, one reaches a more gentle plateau, the route makes a sharp right turn here and continues uphill with new seracs on the left side. Above this, the slope is again fairly gentle. The route to the Silbersattel, the highest pass in the Alps, forks left in this area. (This col separates the subsidiary summit Nordend (elevation 4609 m, prominence 94 m) from Dufourspitze.) 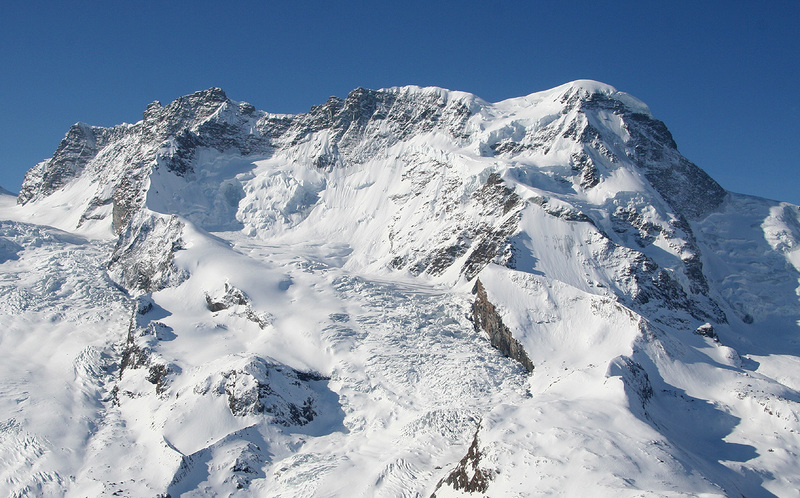 The saddle on the west side of Dufourspitze is now visible straight ahead. The last slope to this saddle is again quite steep. When skiing, one leaves the skis in this saddle. Proceed up the ridge, a moderately steep ascent that brings you to the first rock ridge. This ridge is relatively horizontal, the climbing is easy (YDS class 3), but the ridge is quite narrow in many places. After this section of rock, you face the second snow ridge, gaining almost another 100 vertical meter. The final section is again rock, this section is about 150 meter with a vertical gain of about 30 meter. The route is a bit up and down, also a partly on the right and partly on the left side of the ridge line. After a slightly awkward descent on the left side of the top ridge the route climbs a short, distinct gully which may be quite icy. There is a short, fixed rope in this gully. The final section consists of a big block where the route climbs directly across its top, followed by a small saddle and a final, short climb on the summit block. Trip Report / Comments: This trip was planned as a continuation of "skiing alpine 4000 meter peaks", with the first peak being Gran Paradiso that I climbed 2 weeks earlier. My son Pål Jørgen, age 19, and my friend Geir Åke Dahlen wanted to come along. Åke would drive from Norway, making this project one stop on a longer itinerary, while Pål Jørgen and I would fly from Bergen. May 1st. was a holiday, so we had decided to make this a four day long weekend. Pål Jørgen and I caught the 0630 flight from Bergen via Copenhagen to Geneva. 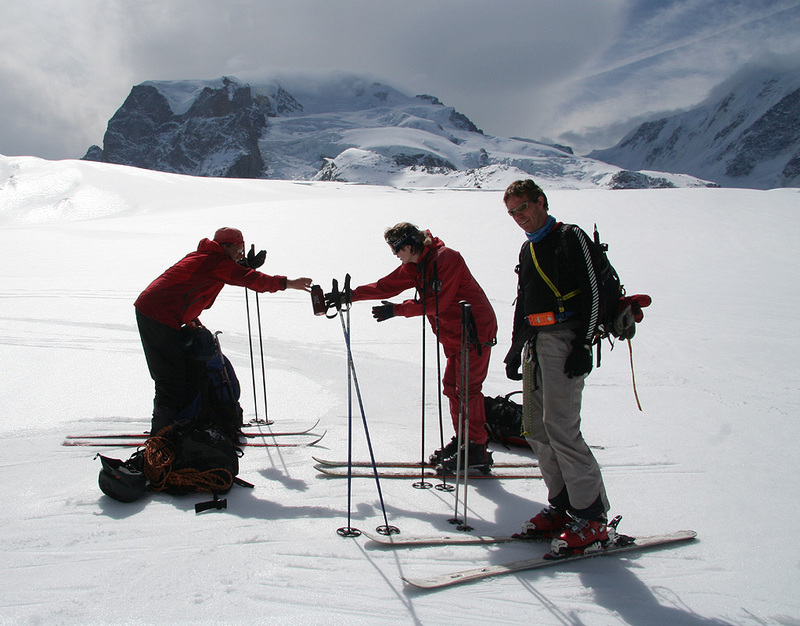 The plan was to meet Åke and travel to the Monte Rosa hut in time for dinner. As there is no service on SAS flights, I brought a couple of fresh rolls to have for breakfast on the plane. Half way into the first one, some piece of metal was felt, my surprise was considerable as I got a gold tooth out in my hand. This gold tooth had been in place since 1992 when a wisdom tooth fractured. Well, hopefully this would not bother me too much, the repair work would have to wait until next week. Arriving in Copenhagen, our (on time) flight got stuck waiting for a gate that was occupied by another aircraft. They told us that luggage had to be off-loaded due to a no show passenger and that this (search) took time. Indeed, after a 25 minute wait, we finally got to the gate with less than 10 minutes to connect. Arriving at gate D4, it was pretty typical that the departing flight left from gate A17, about as far away as one can get in Copenhagen. We made the flight, but our luggage, skis and mountaineering equipment, did not make it. Bad news! We were told that the lost luggage would arrive in Geneva around 1930. Plans would need to change. We decided to spend the day exploring the trailhead of Dents du Medi, another ultra prominent mountain. It turned out that Åke was driving just a few minutes ahead of us. He pulled out at a rest area and soon the team was assembled. 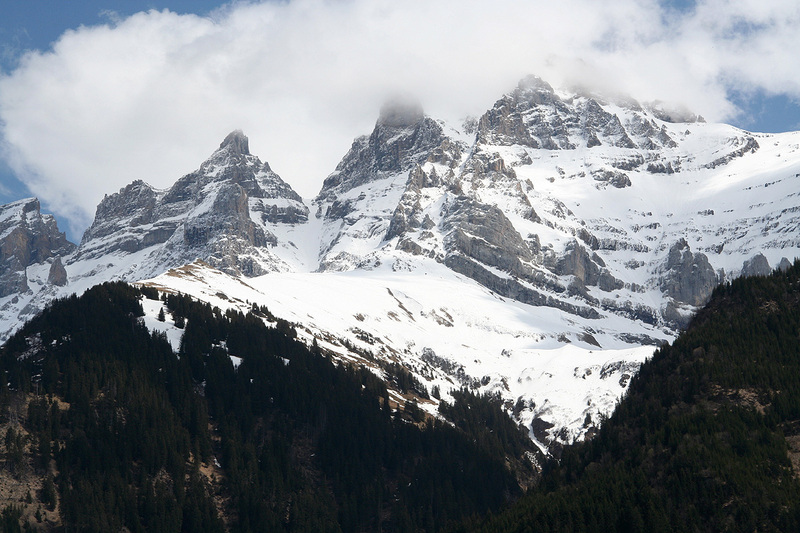 We drove up to the village Champéry, had lunch, then proceeded Grand Paradis, a possible trailhead for this mountain. We drove a bit further, then hiked a random trail in order to at least get some exercise and feel a bit thinner air. The trail was not in much use and some recent logging activity had contributed to several obstacles. We rested at a small hut, elevation 1745 meter, then turned around. We were soon back down by the car, the area was nice and we look forward to a return visit to climb this peak. The backpacks and skis finally turned up and we could start driving towards Zermatt at 2000. 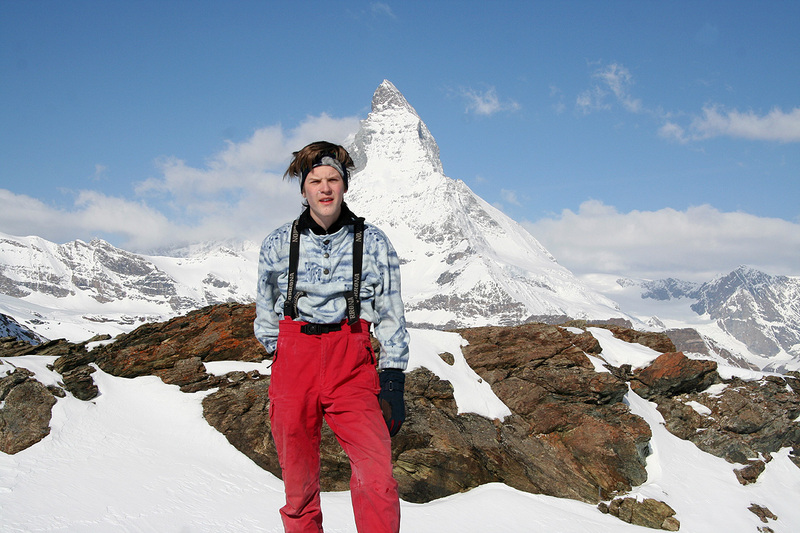 Åke had been sent ahead to secure a place to stay in Täsch, the closest place to Zermatt where one can drive. We stayed in a hotel called Elite, at the far side of town, quite OK with parking also for the next two nights when we would be in the mountains. Friday morning, we got a lift by the hotel shuttle to the "no car" boundary of Zermatt, a short walk brought us to the main station for the Gornergrat cog railway. 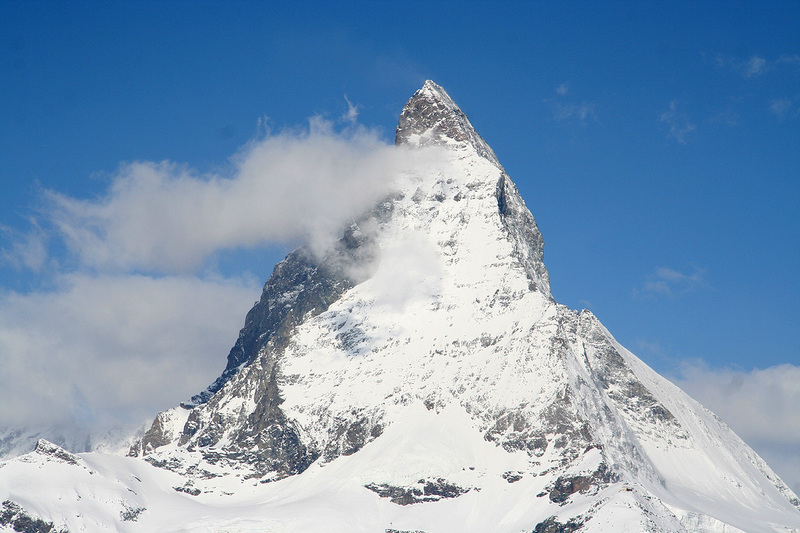 A first look at Matterhorn is always breathtaking. We caught the 0824 train and unloaded at Rotenboden around 0900. Fantastic weather and incredible scenery! This place is truly unique in Europe. Already at 2800 meter with famous peaks in a wide semi-circle around. Castor and Pollux, the twins (Latin: Gemini), the two sons of Leda (Greek Mythology). 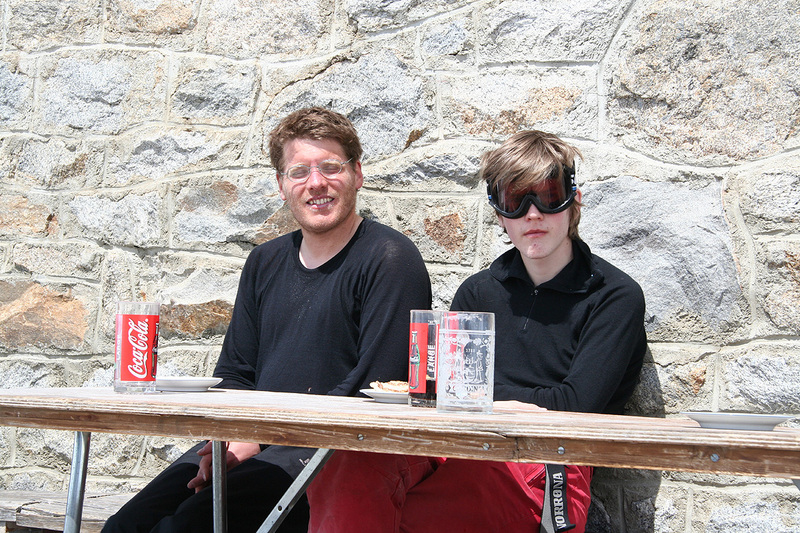 How fortunate I am, here with Pål Jørgen, he is 19 now and ready to leave home for university studies this fall. 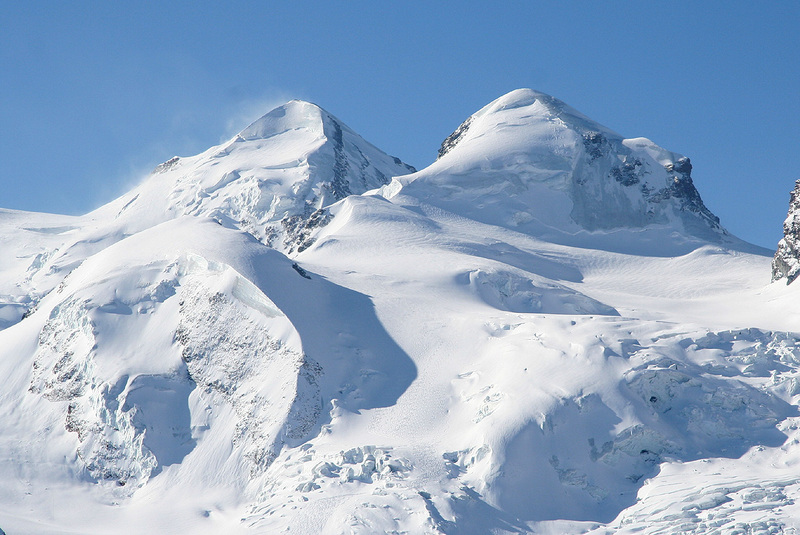 Breithorn, is a truly impressive mountain when viewed from this side. The huge glacier flowing down between Dufourspitze and Liskamm provides a backdrop ice scenery that must be among the best in Europe. 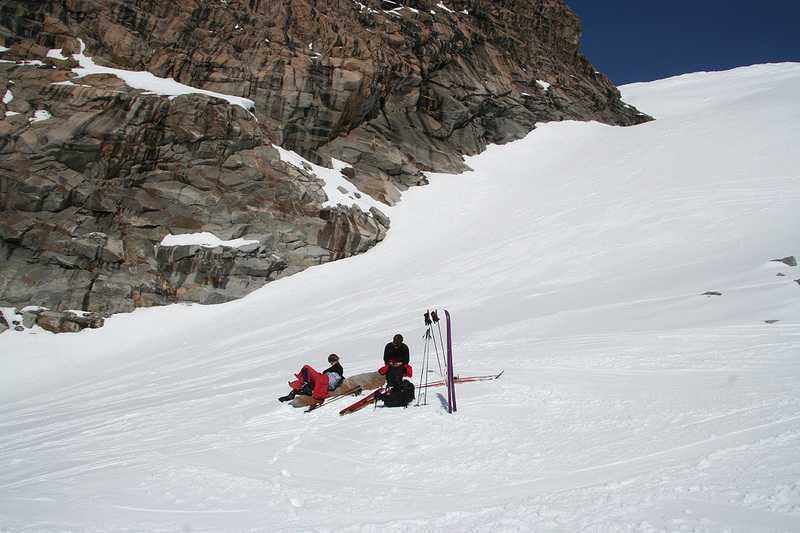 We hiked the nice trail down to the snow, then skied the remaining down slope before reaching the main glacier. 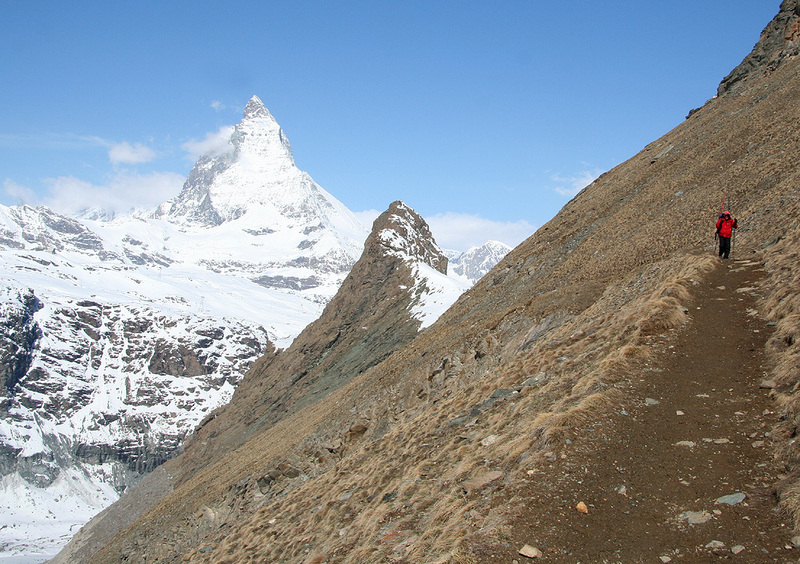 While walking along this trail, one has the full view from Duforurspitze (left) to Matterhorn (right), not a single brief look, rather one can take the views in again and again for every step and with every beat of your heart. The final ascent to the Monte Rosa hut is quite steep. In particular, this early in the morning the north-west facing slope was hard, icy crust. Thus, we all ended up putting the skis on the backpack and crampon up the upper part of the hill, arriving at the hut around 12 - noon. We rested and settled in, then took a short uphill skitrip around 1430. 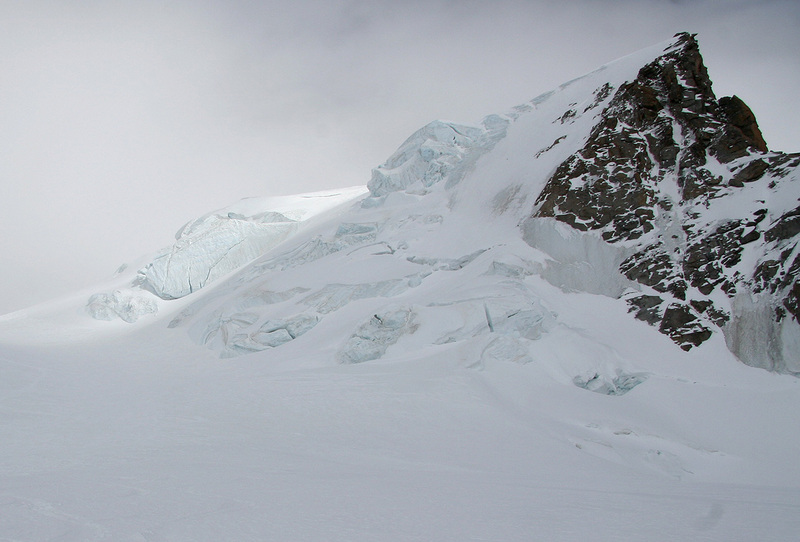 We skied up to a local icefall that certainly provided access to even higher terrain above. The weather and views were still first class. 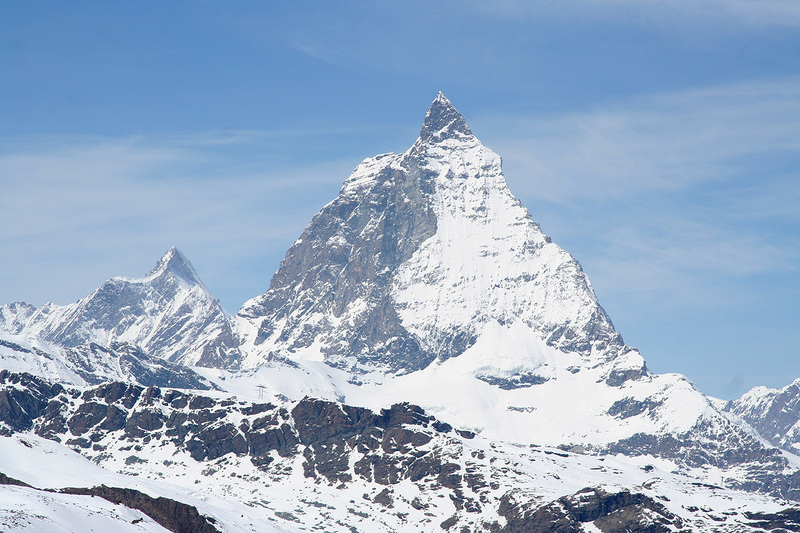 Matterhorn looks equally impressive from this viewpoint, different from the classic Zermatt view, but still fearsome. We did note that there was an alternative hill, it looked steep, but several ski tracks showed that also this route was being used. We took a good rest while looking back down before returning to dinner well before 1800. Saturday, breakfast at 0400, clear skies with scattered stars. We left at 0515, already enough daylight to leave the headlamps behind. The first rays of sun soon started striking Breithorn. The valley was still in deep shade, but everything pointed to yet another fantastic day. 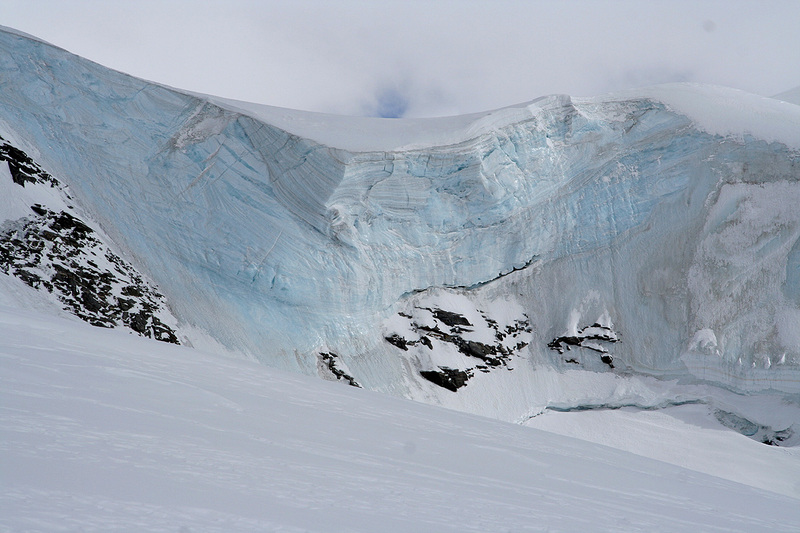 We made good progress and after one hour, we were back at the base of the icefall. The morning crust was hard and the icefall a bit steeper than anticipated, but no real problem. Arriving at the top, it was clear that everybody else skied the alternative hill. We continued steadily uphill, the weather was nice and quite a few people seemed to have the same goal as ours. Gradually, we gained elevation. The view back showed that we made progress. This is indeed a very long uphill ski. We got above 4000 meter and new peaks including Mont Blanc, came into view since we now could see across the previously so imposing 4000 meter peaks. 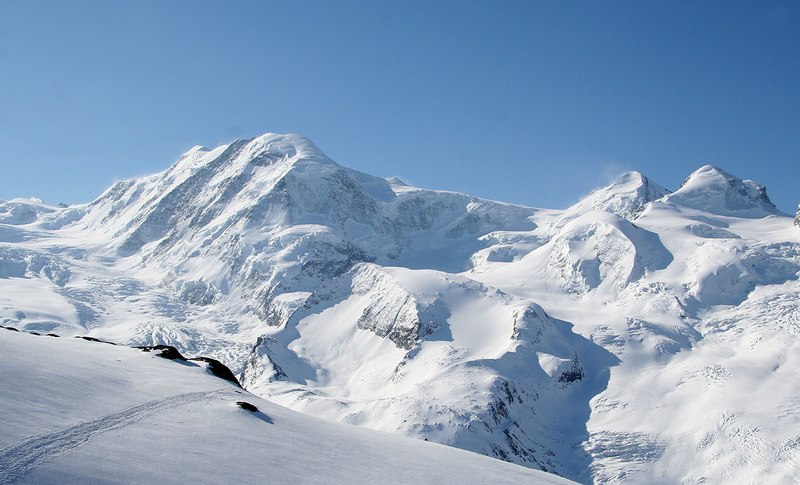 The top section of Dufourspitze came into clear view. Unfortunately, clouds also started to show on the highest peaks. 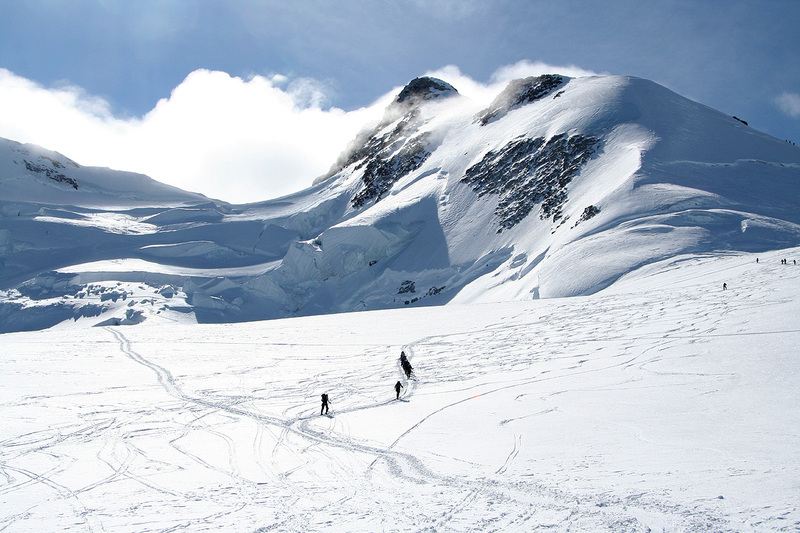 We arrived at the final hill to the col west of Dufourspitze together with quite a few other skiers/climbers. The hill was steep enough that I simply parked my skis and continued up to the saddle with crampons. Pål Jørgen skied all the way up, while Åke carried his skis up top the col. The time was approximately 1130, the clouds had continued their presence and one of them had parked on and around the summit. It had taken us about 6 hours to ski from the hut and up here. We left one pack and the skis behind. Pål Jørgen carried the rope across his shoulder, while I carried extra clothing and climbing gear in my pack. 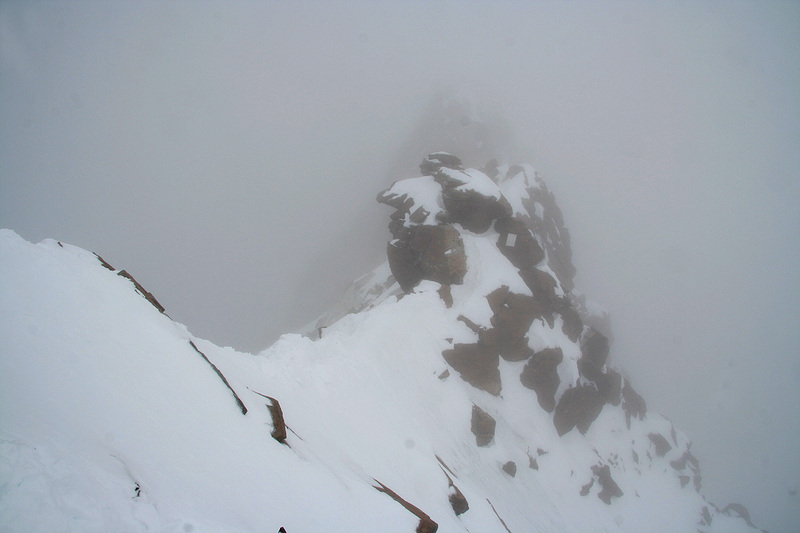 The route continued upwards along a moderately steep snow ridge that vanished up into the fog. We quickly gained a point with some rocks. At this point Åke decided to turn back. This was unfortunate, but we all realized that this project would require more time than available if we should belay along such a long ridge. Åke told us that he would wait in the col. Pål Jørgen and I continued and arrived at the end of the snow. From here, an almost horizontal rock ridge disappeared into the fog ahead. The climbing was easy, but the ridge had plenty of exposure both left and right. In several places, the path was not much wider than our boots. We were just about to overtake another team when a new uphill snow ridge emerged in front of us. The team in front had three members. They walked in a rope, but with no belays or security, just the way that is very common in the Alps, however with rather dubious safety. 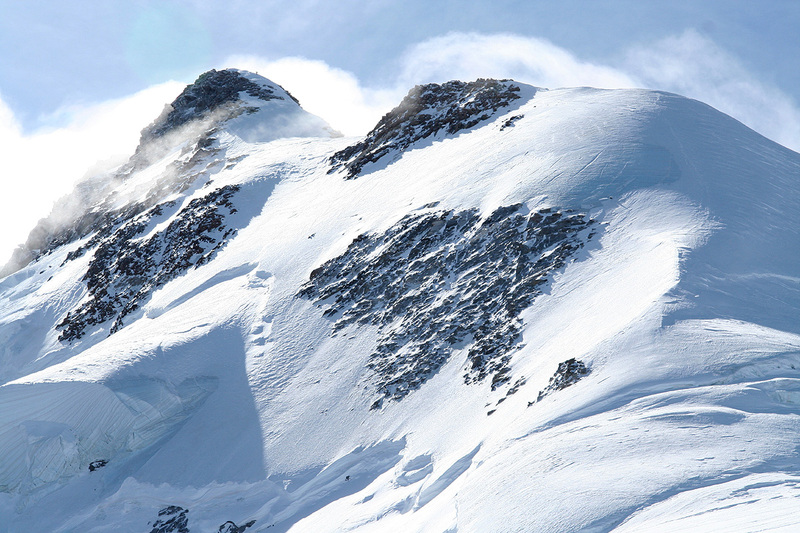 This snow ridge was similar to the first one and rose another 100 vertical meter. We met a man that returned from the summit near the top of this ridge. When asked about how much remained before the summit, he replied: "One hour". That seemed surprisingly long, hard to believe. We continued, with more scrambling, then arrived at a point where, obviously, another party had left their ice axes behind. This seemed like a certain sign that more climbing lay ahead. We left our axes as well, then Pål Jørgen asked: "Dad, how high are we?". I checked the GPS and quickly got our location: N45:56.238, E007:51.927, 4609 m. Good news, we were only 25 (vertical) meter short of the summit and 120 horizontal meter away. Given the fact that we had dragged our rope all the way up here, we decided to use it for extra protection across the short stretch that remained. The rest of the climb went quite well, obviously slower with a rope, but no big difficulties. The single most awkward point seemed to be a small down climb just before the icy gully. We met another pretty large group returning from the summit, this caused a 15-20 minute wait in order to let them pass in an orderly fashion (this team was also roped, seemed to be led by a guide). We reached the summit at 1410 and stayed until about 1430. Not much to see, the nearest outline of the ridge towards the east to the Silbersattel. The summit cross was surprisingly low. We were the last team to summit this day (the team we overtook turned back before the summit). In fact, counting the number of people on the ridge, we concluded that very few of the people that started out skiing actually made the summit. Quite a few must have been content with skiing to the col, then turning back. 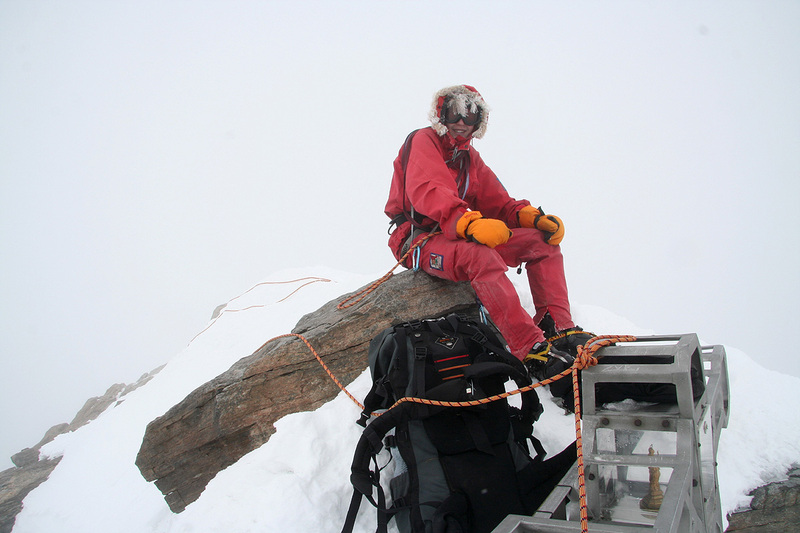 The fact that we lost most of the visibility may also have convinced several teams to not attempt the ridge. We returned on a running belay to the ice axes, then continued unroped from there. We were back in the col at 1550, the round trip climb on the ridge had required more than 4 hours. Åke was sitting in his bivu-sack, he deserves credit for great patience and always a good mood. 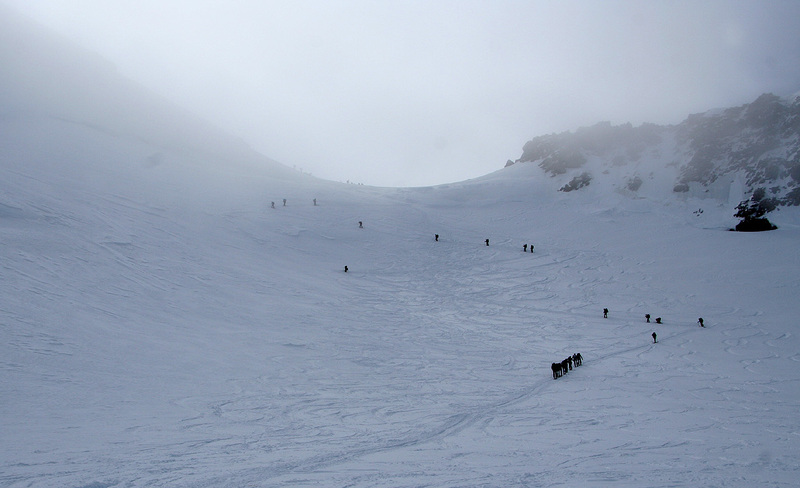 We started skiing downhill, fortunately, the visibility returned as we approached 4100 meter. It was still a long downhill ski for tired legs. We arrived back at the Monte Rosa hut shortly before 1830, a bit late for the first dinner serving, but looking forward to the second serving starting at 1930. Sunday, breakfast at 0700, nice to sleep a few hours after most people hurried out before 0400. Another really gorgeous day. I chatted with Peter from London. 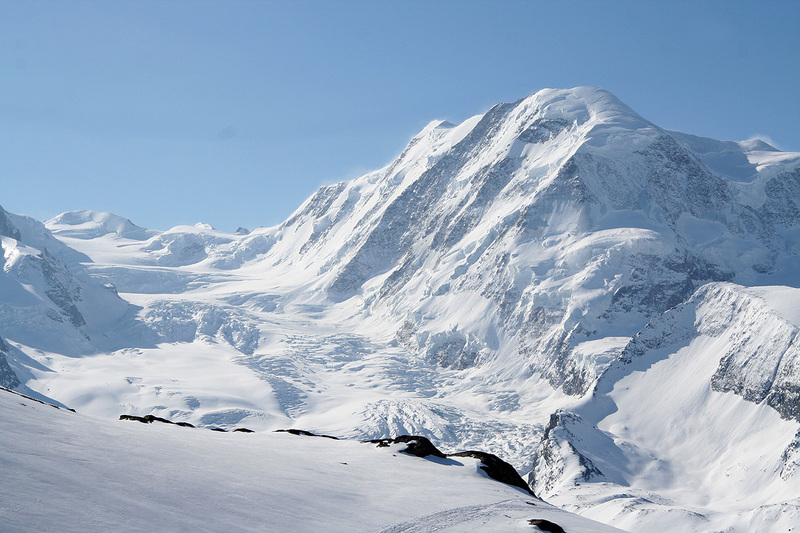 His group would attempt Dufourspitze today, but he would return to Zermatt as his new boots caused pain. He had told me earlier that they had arrived to the hut via the Traverse, and when I suggested that we would return that way, he asked if he could join us. I welcomed this, always nice to have new company and the fact that he knew the route was also nice. We started out shortly after 0830 and reached the train around 1250. This route can be highly recommended, the skiing down the glacier was just super. We said goodbye to Peter in Zermatt, then parted with Åke back at hotel Elite. He would continue his trip into Austria, while we would fly home early Monday in order to catch school (PJ) and work (PB) from noon onwards. Thanks are due to everybody for making this another very memorable trip to one of the most spectacular mountain regions in Europe. Panorama view, this is from the Rotenboden train station. 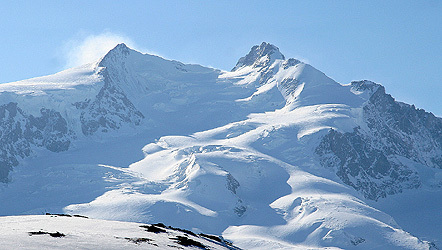 Breithorn, 4164 meter. 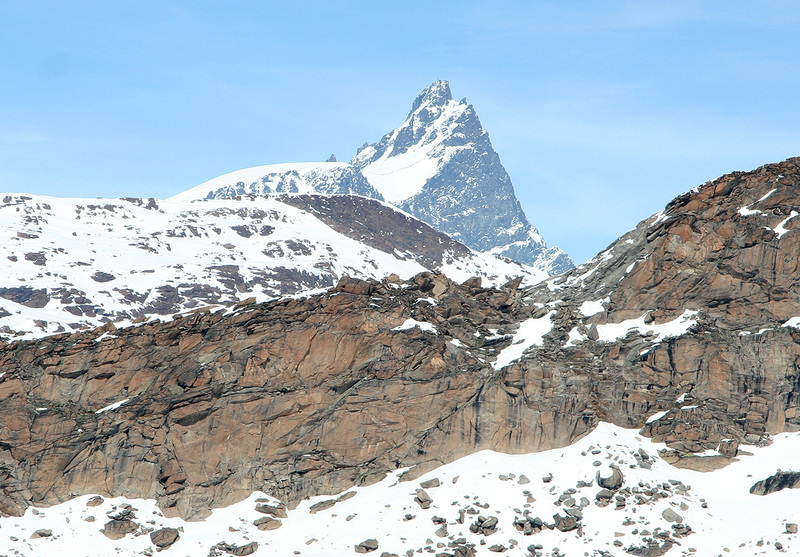 This mountain is among the easiest 4000 meter peaks in the Alps when climbed from the Kleine Matterhorn gondola that serves the opposite side. 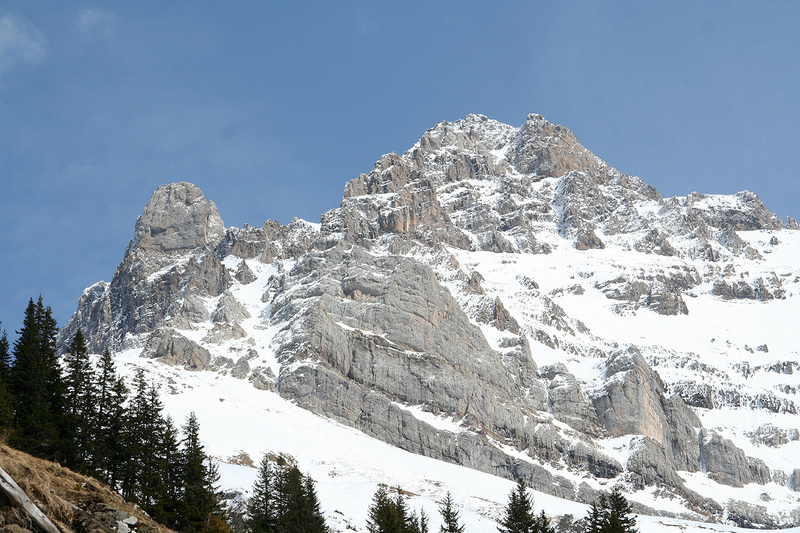 Liskamm (Lyskamm), 4538 meter. The twin peaks further right are Castor (4230m) and Pollux (4092m). 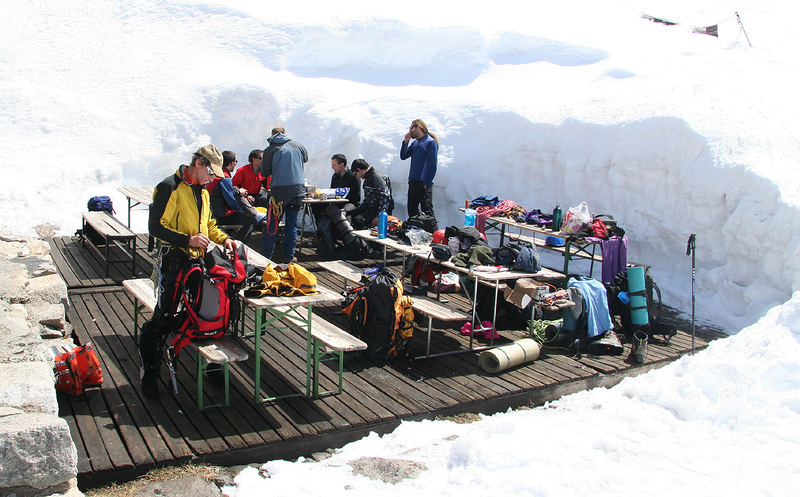 Outside platform, the Monte Rosa hut. Panoama view from about 3200 meter above the Monta Rosa hut. Alpine peak, same location as the previous picture. The route to the Silbersattel, between Nordend and Dufourspitze. Ice landscape, early evening, descending.